*Specials below are not available during CUBS HOME GAMES, Metro/Smartbar Events, or Delivery. Win the coin flip and recieve $1 off any slice. If you lose just pay the regular price. Play roulette and get a $1 off on your slices or possibly get 50%-100% off your order if you guess the number correctly. 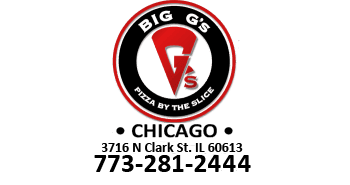 Come to Big G’s with 3 friends (total 4) and a bottle of wine or a six pack (No Corkage Fee) and we will knock off a dollar for each individual order.